What is the syllabus for? Answer this before you read on. So what did you say? It's a question I ask interviewees for jobs in my department because think it's one of the most important questions if the sciences are going to be taught the way I want. That way is simple; it shows that chemistry is interesting and fun. Now I will say something which will make some of you angry. I don't much mind about making chemistry seem useful, at least in the usual sense of 'relevant' or 'industrially important'. This applied side doesn't particularly interest me. But more of that later. The syllabus tells students and teachers what could be in the exam. That's it. Nothing more. It does not tell teachers what to teach, nor students what to learn. Like most legislation the syllabus has to be tested in the chemical equivalent of the courts, so there are always arguments at setting meetings as to whether such-and-such a topic 'pushes at the limits of the syllabus'. There are often arguments from teachers too, usually on topics other than those which I had to discuss before. I must be sure that I can justify the questions I have set, which is why I have to provide documentation to show how the questions address the syllabus. So what about Salisbury Cathedral? I used the following analogy during one of my usual bits of improvisation in a meeting in 1996. It got me into enough trouble to make me feel it is worth using again, so I have, often. 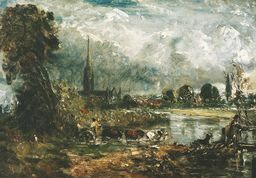 In the Tate Gallery, near to where I live and work in London, hangs Constable's 'Salisbury Cathedral from the Meadows'. Now Constable was less interested in the architectural detail of the cathedral than he was in putting it into its context, that is its landscape. If he had wanted to worry about the detail, then he could have produced the architect's drawings and addressed things in that way. You see, I don't think it's possible to know too much. You have to learn and learn and practice and practice, and perhaps learn and practice things which are relevant to the syllabus but will not be examined. DO NOT MAKE THE MISTAKE OF THINKING THAT IT'S WASTED TIME. I'm not suggesting wildly off-the-mark things (unless you're interested - do them then), or using 'reading around' as an excuse for not doing set work; but the subject does not end with the syllabus boundary. Syllabuses are arbitrary, and if I had a free hand with the one I examine some items would go and others would be included. Let's have an example. In the London Modular syllabus there is a section on the solubility of ionic compounds, linked to the idea that if the hydration energy of the (gaseous) ions is more exothermic than the (endothermic) lattice energy then the substance will be soluble. This is another way of saying that a substance dissolves if the enthalpy of solution is negative. You can go and learn all this, and use it to explain the solubility of the sulphates and hydroxides of group 2, and the hydroxides of group 1, and you have satisfied the requirements of the syllabus. Get a question on it, and you could answer it. If that's enough, so be it. But I dont think it is. Just a little bit more will give you a much better understanding of the problem. You may know that the substances specified in the syllabus are only those that can be described using DH alone. The same arguments do not work for the silver halides, for example. The syllabus is selective; you do not get a universal principle. Learn more, and you will find something that is applicable to other chemical situations; you will not only have generalised but will have found links to other parts of your work. That little bit more is the idea of entropy. This is not the place to deal with it - there are plenty of texts where you can find out about it - but the principle of looking around what you have to do is valuable because you then have a landscape which complements the main edifice. For some this complement may well be the applied side of chemistry  if so, thats great. There are many ways of learning chemistry. Unlike Constable you have some choice about your landscape. Some teachers and students say 'No! There's too much to do already!' My answer is that understanding a greater generality makes things easier. No longer do you have a series of apparently magical or disconnected statements, but a clearer overall picture. In entropy you have a key to the explanation of chemical equilibrium and the different sizes of equilibrium constants, of solubility for all ionic substances, of the reasons for the possibility of endothermic processes - and lots more. It isn't in the syllabus, but it helps enormously with that that is. The end result is that you need less time learning the stuff that is in the syllabus than you otherwise would, because you understand it so much better. This is just one example. It also happens to be one of the topics that I think should be in all A level chemistry syllabuses! If I had to point out a single way in which teaching has changed over the last 30 years, it would be that there is too much adherence to a shopping list (the syllabus) and too little inclination to move outside it. To stay on this road assumes that syllabuses make some fundamental coherent sense that needs no amplification or explanation. Not true, for any of them. Or 'there is too much to do.' Also not true, if you work. Be bold and inquisitive and explore the margins, whatever interests you, and you'll be amazed at how helpful it can be. I made an unfashionable statement about applied chemistry and industrial processes earlier. I have seen no evidence ever that making chemistry more 'relevant' or 'meaningful' increases its appeal for everyone. Making chemistry relevant excites or interests some, but bores others. I am not saying that chemistry isn't important industrially - of course it is. But the problems of applications are more technology than science. I am grateful for the technology that enables me to write this on a palmtop by a Turkish swimming pool and for the chemists and engineers who developed the technical wizardry. This, though, follows on from principles; it is the principles that interest me. You may be different, and should be. I don't want to be cloned. Lastly I shall parade another unfashionable prejudice. I think that lots of the environmental stuff peddled in the popular press and in much of the syllabus content at GCSE and A level is superficial and often trivial and does more harm than good. That's why none of my students is allowed to use the words 'ozone' and 'layer' on the same day. Maybe I'll write about that next.